2010 Rifle Shootout Part 1! This review covers 17 silencers. Ten are 556 and seven are in 762. Two weapons were tested in 556 and the Remington 700 LTR was tested in 762. Test was conducted October 30, 2010. Click HERE! Thompson Machine 22LR Silencer Review! This review covers three of Thompson Machine's 22LR silencers on the Walther P22, the Ruger MK III with Tactical Solutions Pac-Lite upper and the venerable Ruger 10/22. Testing included reference AND ear testing. Click HERE. Baby 5.56 and 7.62 Silencer Shootout! 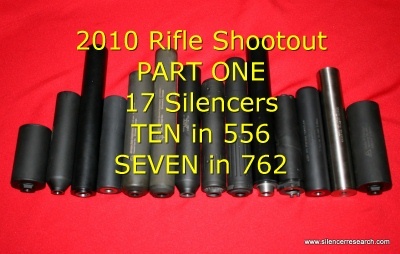 This shootout style review was completed on July 17, 2010 using four 5.56mm silencers and three platforms. The baby 7.62mm silencers were tested with a 20" Remington 700. These tests include both reference location and at the ear testing. Click HERE. DeGroat Tactical NANO vs Thompson Machine Poseidon FREE RELEASE!!! This shootout was conducted on the Glock 19 with two types of subsonic 9mm ammunition. Two sound meters were used to show each gunshot with two different location readings. This review is free for anyone who has a free account at this site. Silencerco Osprey 45 vs AAC TiRant 45 vs HTG Cycle II 45 review is available!!! I tested three 45 silencers on the HK USP 45 and the Glock 21. This test included Mil Spec at the ear testing of both weapons. Don't miss this review!!! Click HERE! Are Dirty 9MM silencers louder? This study is a culmination of over 2.5 years of shooting a 9MM silencer and watching the performance. The results are finally in. Don't miss it! Click HERE! 2009 45ACP SHOOTOUT RELEASE IS COMPLETE! The 2009 45ACP Shootout was done on August 15, 2009 and the silencers tested both wet and dry with Remington 45 were: Gemtech boostered and unboostered Blackside 45, AAC Evolution 45, YHM Cobra M2, SWR MFG HEMS 2, KAC OHG and two new AAC Silencers...the new AAC TiRant 45's. A new standard of sound reduction in 45ACP technology has arrived! Premium members click the picture! AAC Ti-Rant 9MM vs Gemtech Multimount Shootoff results are out! In the 2009 9mm shootout, the AAC Ti-Rant and the Gemtech Multimount basically tied for first place on the full sized H&K USP 9SD. I thought it would be prudent to do a shootoff style review where we take each pistol I had not already tested and use two ammo types to see if a true winner could be found. Click HERE to see the review. Welcome to the only independent online testing resource for civilian legal silencers. This website is dedicated to researching the ins and outs of silencers in practical civilian use. I will be conducting tests on various weapons and silencers and sharing those results here. Just signup with the link above so you can access the forums and stay up to date with all the latest silencer developments and chat with industry professionals. Using the information provided may save you the expense and headache wasting $500-$1,000 on a loud silencer or one that doesn't properly fit your needs. Is there such a thing as a loud silencer? You bet there is! Don't waste your hard earned dollars on one. Some of the free tests include the AAC Prodigy, the Gemtech Outback II, the LRM M169 9mm upper, the Tac 67 cleaning pictures, the SRT Arms Integral 9MM system, the John Norrell Ruger 10/22 and others. Many videos are included and lots of pictures are located in the reviews so you can see what everything looks and sounds like. Heads up shootouts with the Beretta 92FS, the Glock 17, the Sig P226 Tactical and the H&K USP 9SD are available with many different 9mm silencers. Other silencer reviews are coming up in the future and will provide you with in depth detail of each silencer. The owner of Silencer Research LLC is John Titsworth, Jr. and Silencer Research LLC is a type 07 Federal Firearms License holder and a 02 Class special occupation taxpayer. I don't take money from manufacturers, dealers, or advertisers, so your support is vital in keeping the reviews coming. This now discontinued model silencer has one stainless steel blast baffle followed by 4 aluminum baffles. Both end caps are threaded to allow complete disassembly by the end user. The baffles used in this silencer are the ported "K" baffles. The pictures here are indicative of around 1,700 rounds fired from a fully automatic M16 22LR conversion. This review is only of the silencer internals. This large 22 can was built by John Norrell Arms, Inc. as a custom project. The criteria were excellent suppression coupled with a longer cleaning interval and extra weight to help control muzzle flip. The cleaning pictures that are located in the subsequent page show around 5,000 rounds of fully automatic fire from an M16 22LR conversion. These baffles are "M" baffles. This silencer might be one of the largest 22LR silencers in existence. This review of two 9mm uppers for the M16 platform include pictures, ballistics, and some videos. Videos of silencers are deceiving as they don't adequately represent the way a silencer sounds in real life. One of the goals of Silencer Research in the future is to make realistic videos that more closely replicate the sound of real suppressed gunfire. The LRM 169 is an integral upper for the M16. The Gemtech Talon upper is a non-integral upper for the M16. The Gemtech Talon upper is designed to be fitted with a Gemtech Trinity 9mm can. The Gemtech Talon requires the use of 147 grain ammunition in order for the velocity of the projectile to remain subsonic. The LRM 169 does not require the utilization of 147 grain "subsonic" ammo. One can shoot almost any type of regular 115 or 124 grain 9mm ammo and the M169 bleeds off the gases to make the round subsonic. This isn't an official sound test, and was done long before I started this site. I tested 5 types of high velocity ammunition for both dB and ballistics/velocity. I have fired at least 12,000 rounds of CCI Minimags through this suppressor. The ammunition produces very consistent velocities and seldom causes any cycling problems. I loaded an Eagle 30 round plastic magazine with 15 rounds and fired the weapon to test for dB levels as well as the velocities. On July 22, 2007 I did an extensive review of three 9mm silencers with 4 separate popular pistols. I used 3 common ammunition types. The test was to determine the sound pressure levels of each pistol and each silencer as well as to determine the optimum combination. I also tested the ballistics of each ammunition type both with and without the silencers attached. On March 17, 2007, I tested the LRM upper on a factory Colt M16A2 registered lower receiver. I tested 6 types of factory loaded ammunition for ballistics/velocities and for dB measurements. The LRM 169 was loaded with 10 rounds of each type of ammo. No jams or weapon malfunctions were noted during the entire test. There is no way to test the LRM unsuppressed as it is an integral upper and you cannot remove the silencer for an unsuppressed reading. Copyright Silencer Research LLC. No part of any article, any videos, or numbers may be posted or used elsewhere without the prior express written consent of the author. Discussion of numbers released here on forums other than the one provided here, other website chat rooms, etc. is strictly forbidden. Almost 80 silencers were tested in over 200 individual tests with many different host weapons.